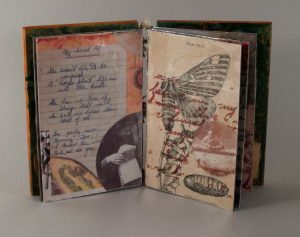 I am a a studio artist, focused on book arts and assemblage. 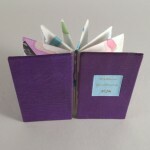 I create artists' books, sculptural books and limited edition books. My work embraces a wide variety of methods and materials. 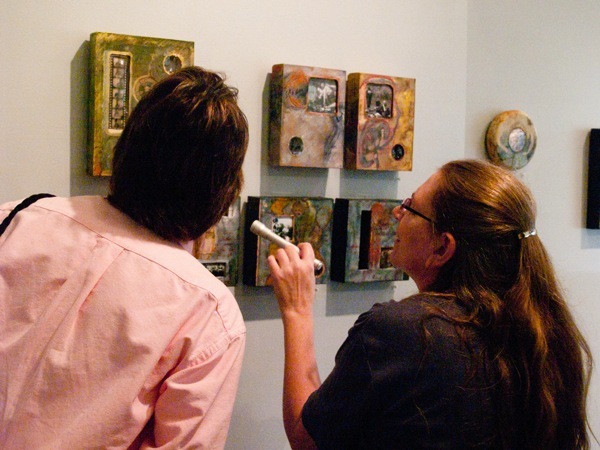 It has been featured in dozens of solo and group exhibits throughout the world and is held in numerous public, private and special collections. 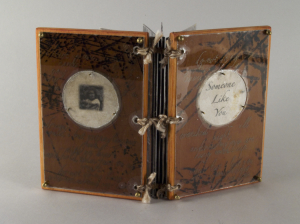 An archive of my work in the book arts is under development at Penrose Special Collections, University of Denver, Denver, Colorado. 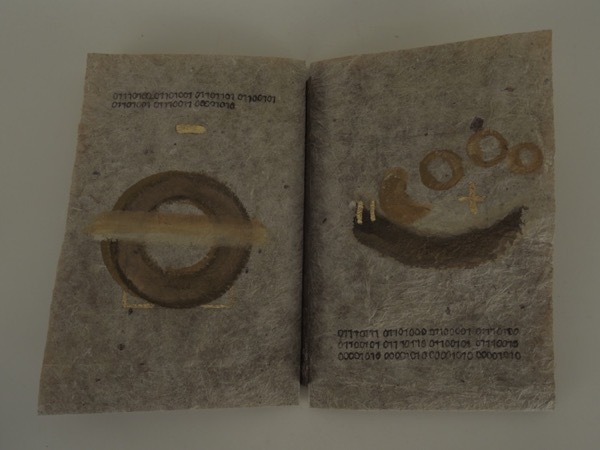 Euxoa Auxiliaris is a limited edition book work I designed and published in 2012. Based on a lowly critter (Miller moth) with a lovely Latin moniker, Euxoa Auxiliaris, this project serves up some evidence that event peskiest of critters have their engaging moments. 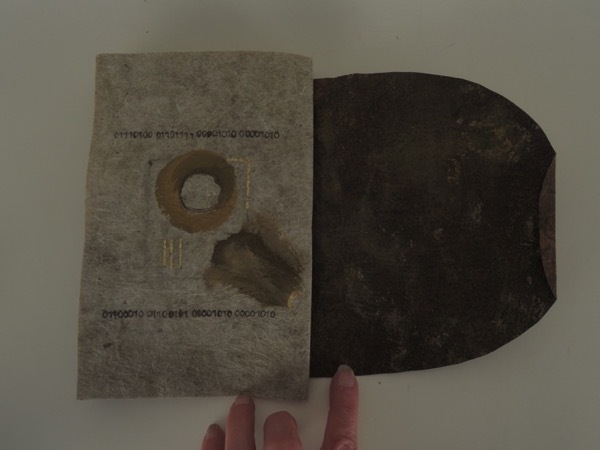 In 2009 I created a one-of-a-kind book, Euxoa Auxiliaris, after discovering a what I always called a miller moth floating on the surface of my glue pot. 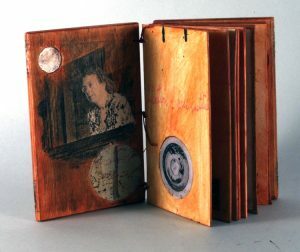 Below are a couple pics of that first artists’ book. A few years later those of us on the high plains suffered through a bonanza crop of moths. It seemed that every waking hour for several weeks was filled with the visual blur of these brown pests, flapping about and banging into lights shades and screens. Agitated not only by the critters, but also because I found them so agitating – a level of annoyance verging on occasional anger, way out of proportion for the actual damage the moths caused (virtually none). 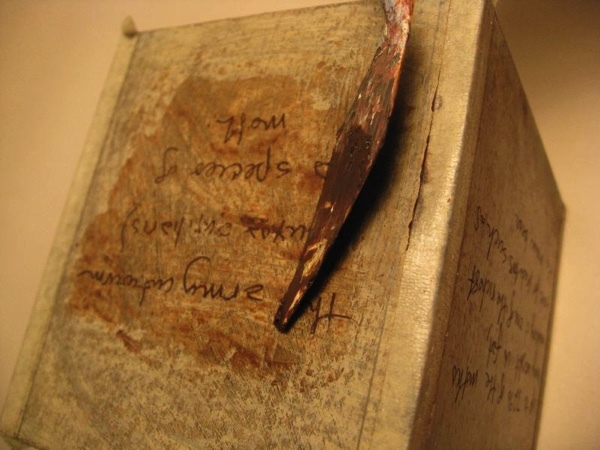 Remembering the 2009 project, I opted to create a limited edition artists’ book of the same name in hopes that collecting specimens for the project (I needed about 60 dead moths) would distract me from my agitation, which it did. 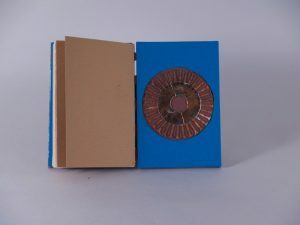 Following are detail process notes about the content, design and build of the second version, which was published in a limited edition of 12 copies. 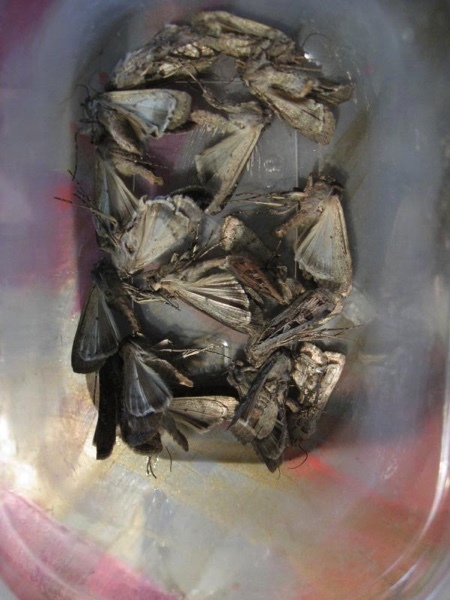 Dead moths are a seasonal thing that tend to fall apart during handling and transport or disintegrate rapidly into unusable piles of insect dust. I put out a plea to friends and colleagues for help with gathering 60 dead moths, in a variety of postures and in good enough shape to cast. 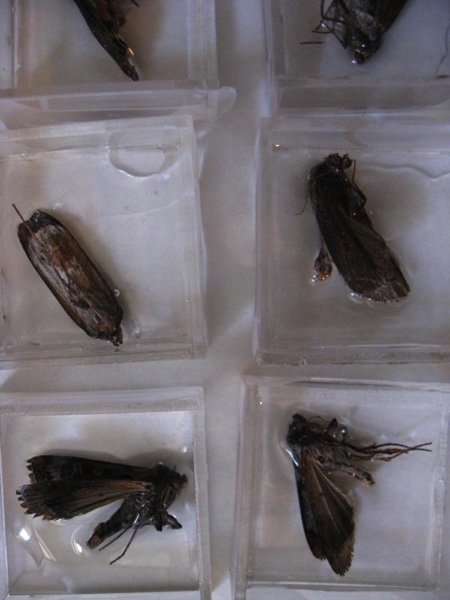 It took some perseverance to get a good supply – I mean really, who volunteers to collect and handle with care dead moths? Happily fellow artists took up the challenge and the need was met. I discovered not only that Mottephobia (fear moths) is fairly common, but that I have friends that suffer from this phobia. So I included a brief mention of Mottephobia in the text for this book. I also discovered other interesting factoids about miller moths. Several of these are printed on the outside of the box. 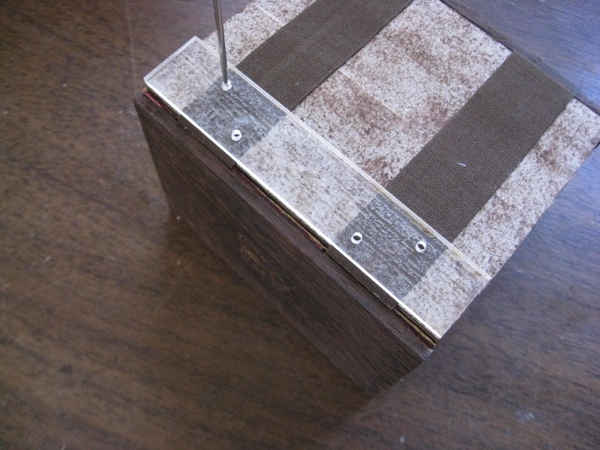 Here’s a pic of the box with text, before it was finished with layers of shellac, acrylic paint, dry pigment and wax. Magnifying lenses pair well with insects so I decided to include a lens in the box lid. 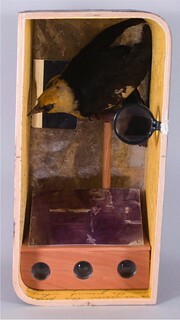 The lens is removable to allow for examining a magnified bit of wherever the box and viewer find themselves. 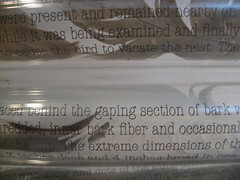 Around the perimeter of the lid are words that further describe the moth genus and species. I developed two additional texts about moths; one is presented on the verso side of each page in a sans serif font. 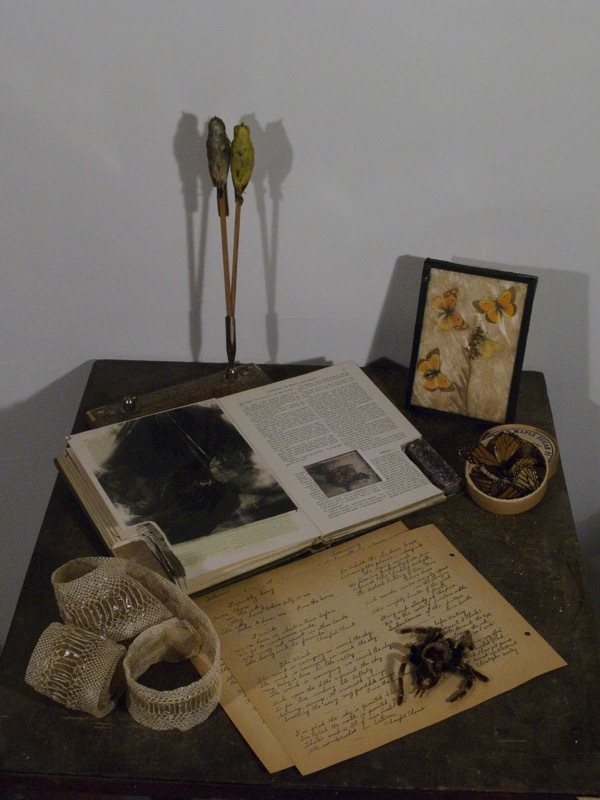 I also included texts and images behind each of the cast moth specimens. The illustrations are based both on direct observation and 19th century engravings found in the public domain. After I figured out the general layout and design, and pared the text down, and down again, I cast the rest of the moths. 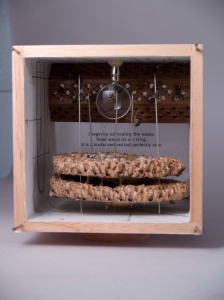 This important and toxic step prevents the moths from disintegrating and disrupts any further biological activity from larvae or other organisms that may have found their way into the moth body cavity. 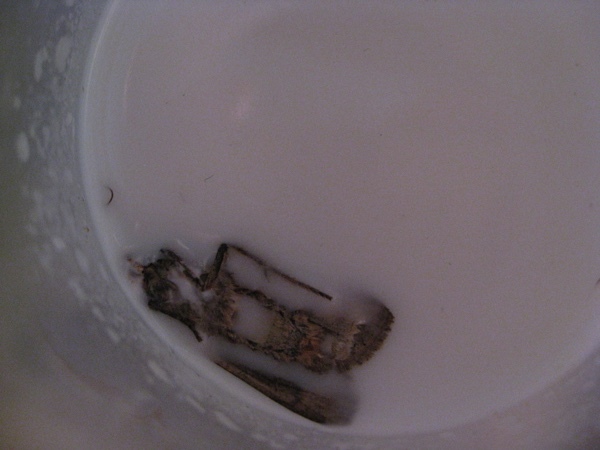 To minimize the appearance of air bubbles trapped in the casting, I dipped each moth in a dilute solution of PVA. 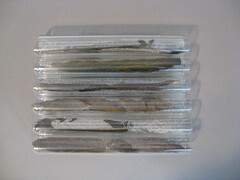 While they were all dripping dry, I made custom plexiglass trays to hold the background text, moth and resin. These were topped off with thin sheets of mica. In a technique borrowed from the picture framing industry. 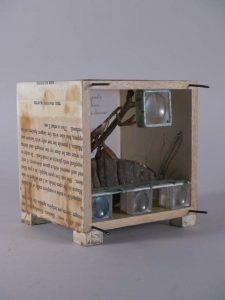 Each page was created as a package, the package assembly began from the windowless side up, the components layered up and glued in place at each step. The windows were laser cut and the text laser etched. 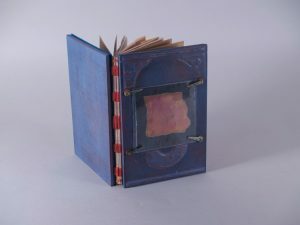 The thick, rigid pages are bound into book form with two strips of book cloth both glued in place and held with escutcheon pins; the covers are attached with the same straps – they extend into recessed areas on the inside of the covers. 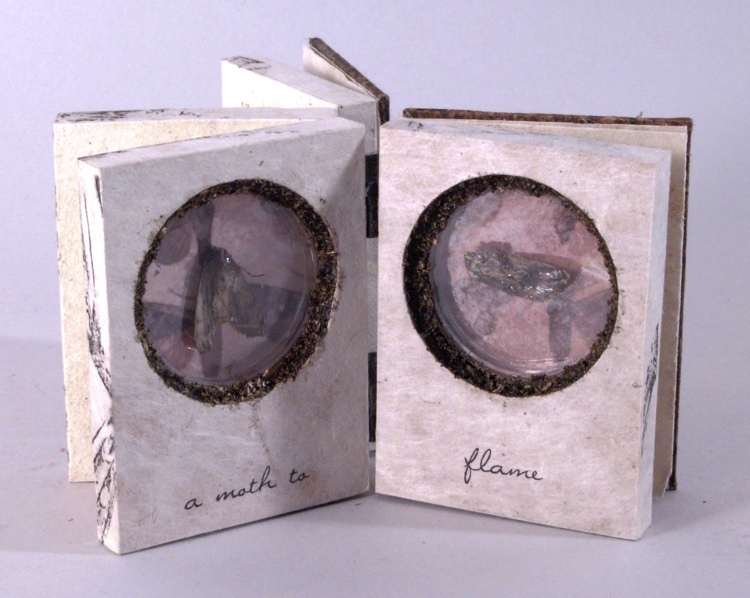 Each of the five pages were built up from the inside out, with a window cut out on one side for showcasing the individual moths, cast in epoxy. This design let me show off the moths. 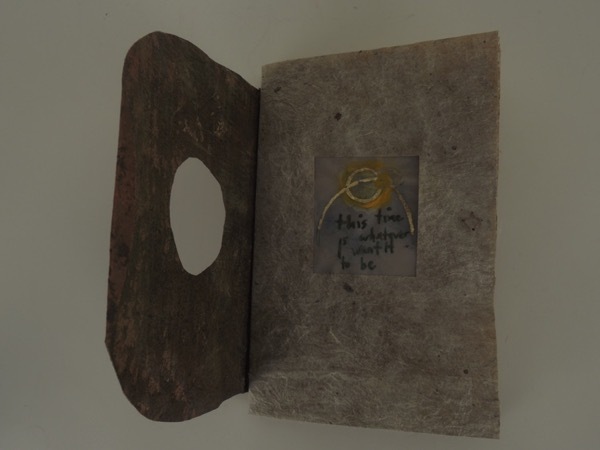 The exposed surface of each page is book board covered with paste paper; the text then laser etched. 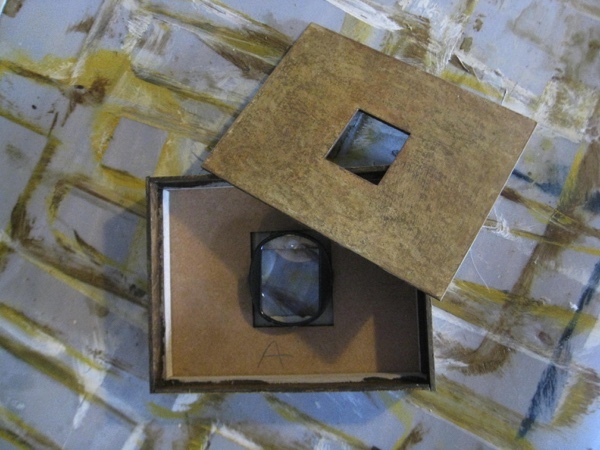 The outside edges are wrapped with a neutral tone Buhgra paper with hand-applied pigment. 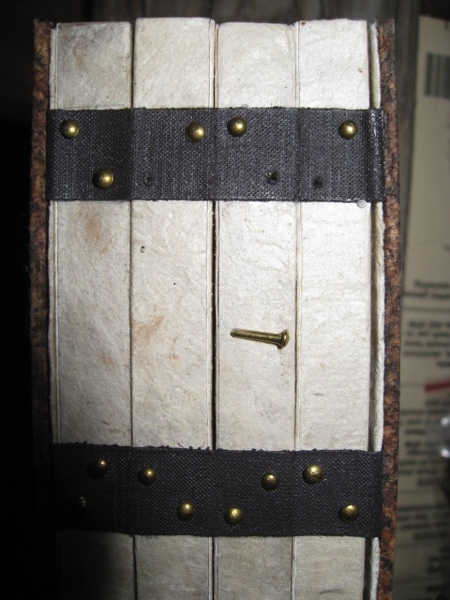 The spine edges had to be reinforced with wood strips as escutcheon pins would be used to hold the pages to the binding straps. 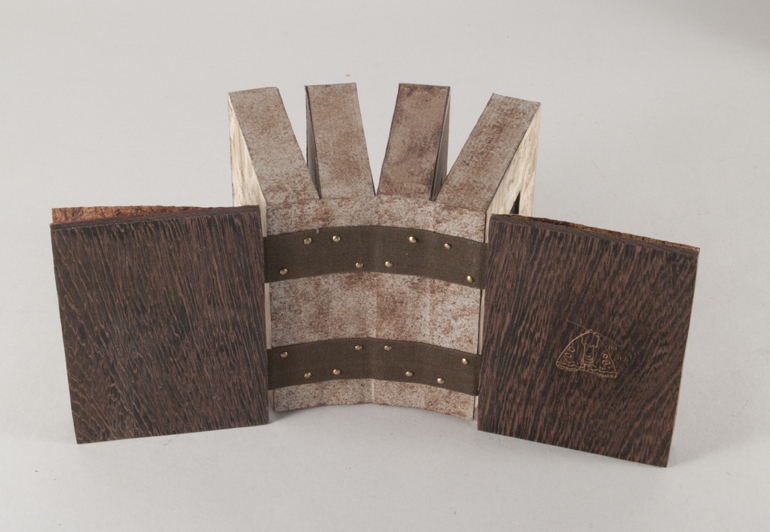 The book covers are wenge wood, laser etched with pigment rubbed into the etched area, then waxed. 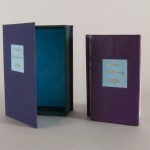 The end papers are two-toned Unryu, with laser etched title and signature pages attached. 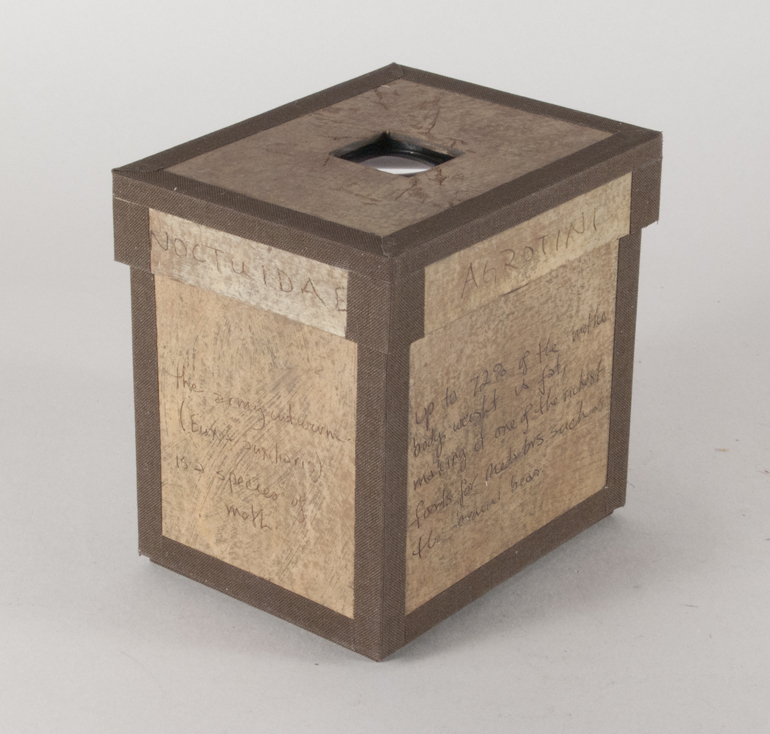 The box was made with laser etched book board, first treated with shellac, then overpainted with layers of acrylic paint, followed up with a wax coat, assembled with book cloth at the corners. 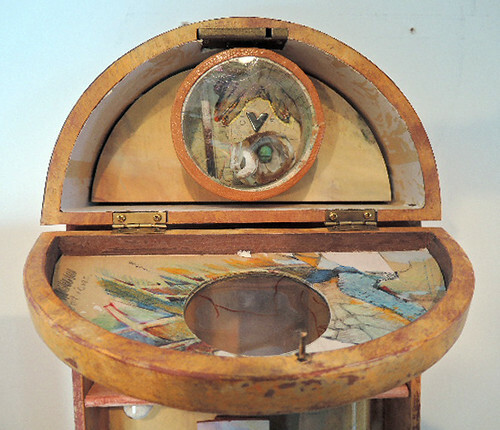 The detached lid holds a magnifying glass that was assembled in much the same way as the individual page packages. Copies of this book is held in the collections at Baylor University, University of Denver, Colorado College,Tufts University and various private collections. Archive and process materials for this work held by University of Denver, Penrose Library Special Collections. To check on availability you can check my online store. Thanks for reading – hope you enjoyed. This piece is available. Click here to purchase. 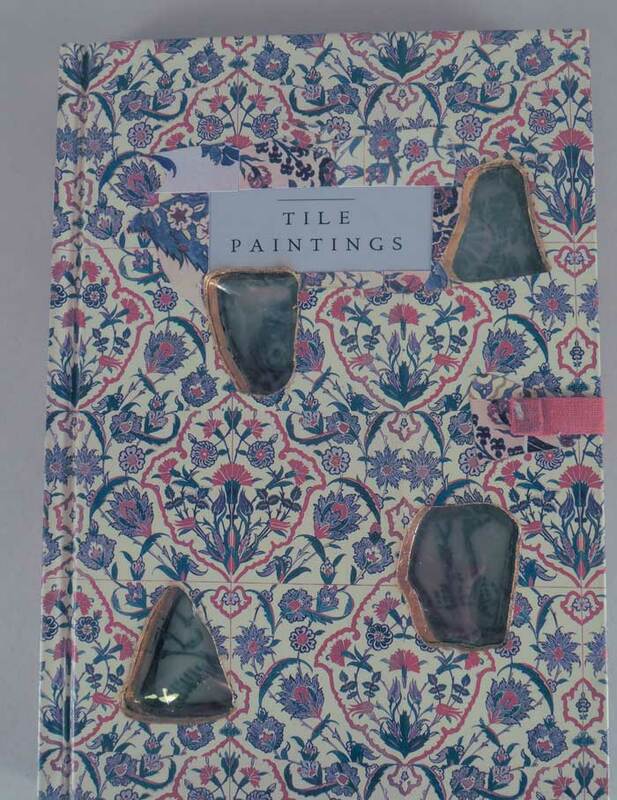 Tile Paintings as an altered book created from a book published by The Victoria & Albert Museum. The V&A Museum, established in 1852, is the world’s leading museum of art and design. The museum’s opening followed the very successful Great Exhibition of 1851. Held in the purpose-built Crystal Palace and organized by Henry Cole and Prince Albert, it was the first international exhibition of manufactured products. Its founding principle, and one which is followed to this day, was to make works of art available to all, to educate working people and to inspire British designers and manufacturers. To this end, the V&A publishes about 30 books annually, working jointly with Penguin Random House and Thames and Hudson. In addition to promoting research, knowledge and enjoyment of the designed world, the publications generate profit for the museum. Current publications range from a charming children’s story by Jack Townend (A Story about Ducks $8US) to a Vivienne Westwood Opus Manifesto limited edition ($2700US). The Colour Book series (published from 1985-1989) includes titles such as Decorative End Papers (1985), Patterns for Papers (1987), Japanese Stencils (1988), Novelty Fabrics (1988) and Ikats (1989). 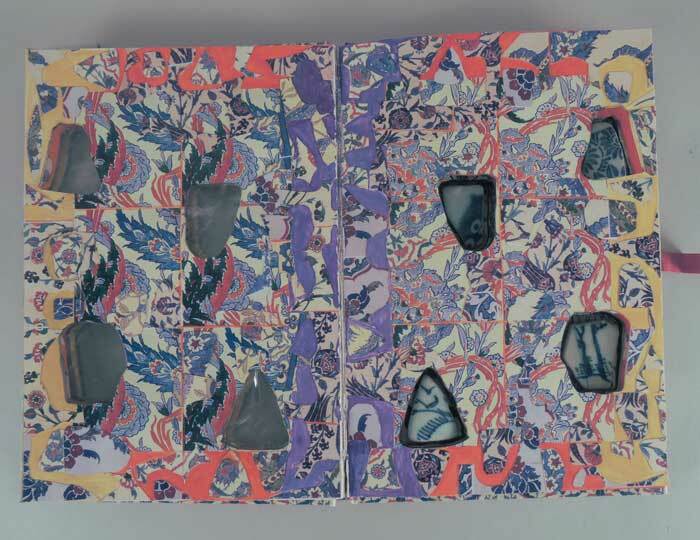 I have altered two books from this series, Tile Paintings (from Series 1 of the Colour books), and Indian Floral Patterns (also from Series 1). You can read my post about Indian Floral Patterns here. 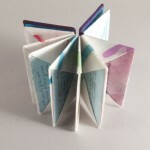 The books are a lovely size to work with (8 x 5.5 x .5); each of the pages richly colored and most with little or no text. Tile Paintings piece is a pairing of the published book with four tile shards that were gifted to me years ago by a fellow scavenger. 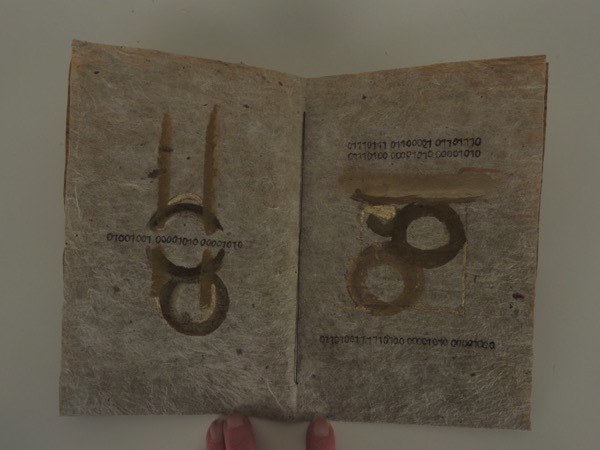 Four shaped holes (roughly following the shape of the shards) have been cut through the cover and all of the pages; in the recesses rest the shards. The shards are protected when the book is closed with mica laminated in between the first end page and first few pages of the text block. With a mix of PVA and methyl cellulose, I laminated several pages together, leaving me with four double-page spreads to work with. 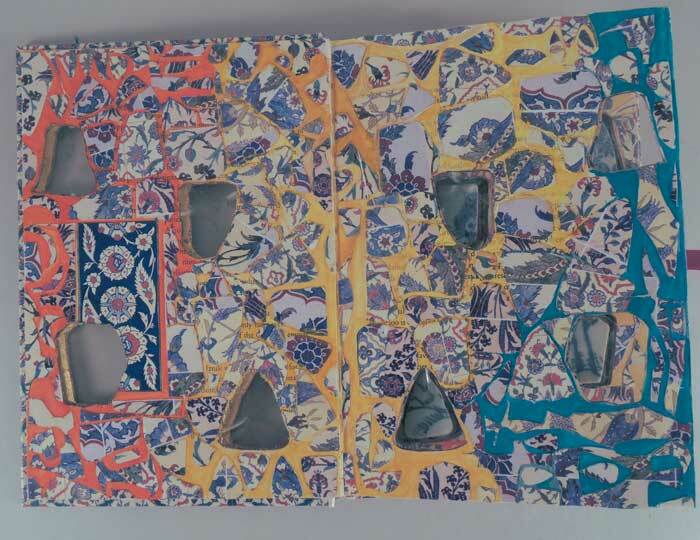 Hundreds of paper cut outs in various shapes and sizes (the cut outs based on the recessed shapes using full-color reproductions taken from the book’s pages) are collaged onto the individual pages, obliterating the text. Areas in between the collaged bits are hand painted with gouache and acrylic inks. 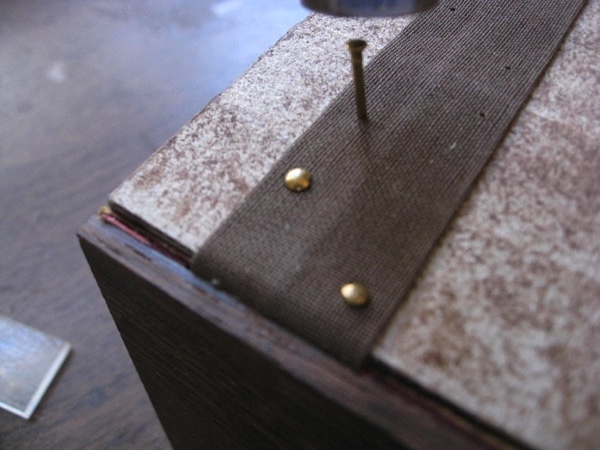 Although the book stays closed on its own, there is an additional magnetic/ribbon closure. 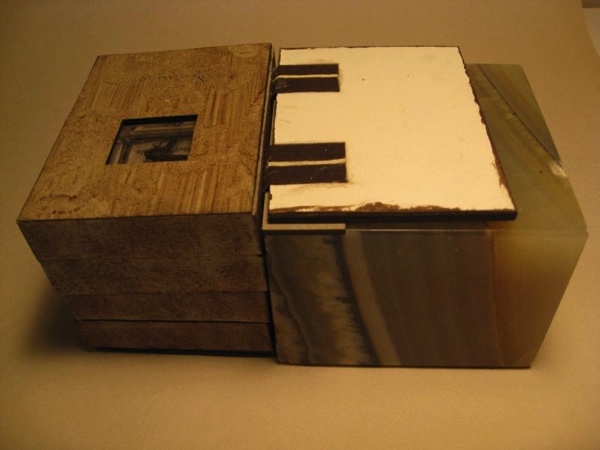 I typically create a utilitarian single tray, drop-spine box for my artists’ books; for Tile Paintings I stepped up from the strictly utilitarian and created a box with the same color-reproductions lining the inside. 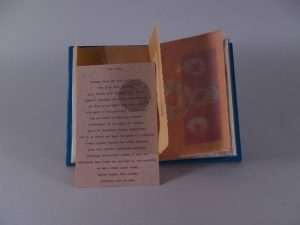 From the Lovely and Amazing series, this limited edition book uses images, artifacts and writings from the archive of my great aunt, Ruth Wheeler. Ruth led a rich and varied life, passionate about both nature and teaching (she was a biologist with a teaching certificate). She had a big impact on how my views of the world were shaped. Creating my own works from that which she left me has brought me moments of joy and a bit of sadness too. 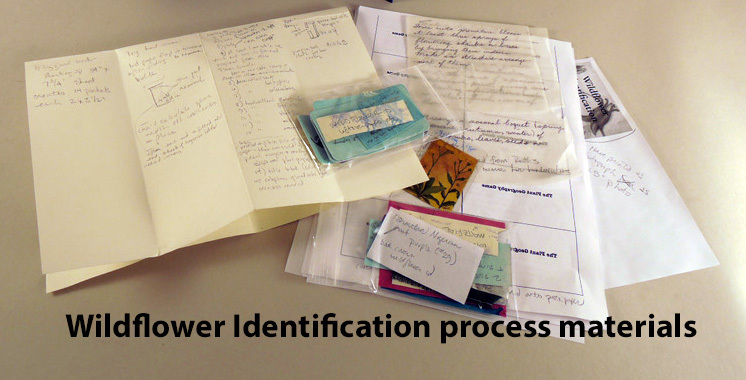 The general parameters of Wildflower Identification were partially set using the Ideation Deck (developed by Julie Chen and Barb Tetenbaum). Cards I drew from the Ideation Deck were the starting point for this book. 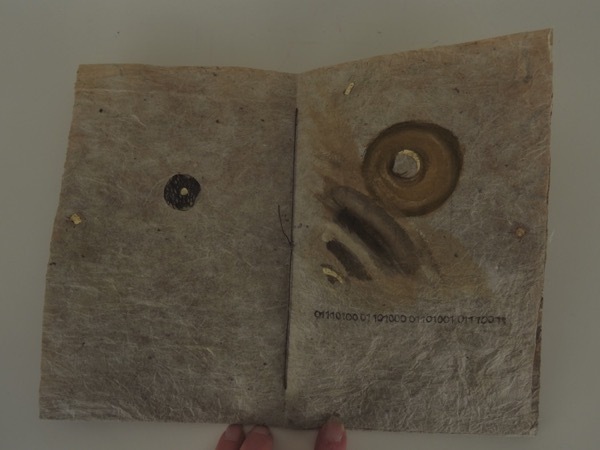 Based on Hedi Kyle’s Blizzard Book (so called because Hedi developed the folded paper structure when a blizzard in Philadelphia kept her studio bound for a day), Wildflower Identification has 14 envelope pages created from one long sheet of Batik paper (imported from India). I chose to work with this structure for a variety of reasons. The most obvious is my wish to present material non-linearly, allowing pages be removed and re-arranged. 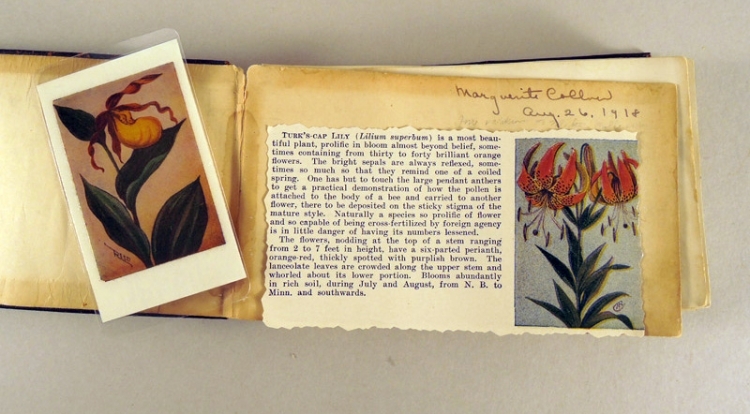 The content of the pages peeks out from that which contains them, reminiscent of plants peeking out, enticing a closer look. More obscurely, I chose this structure because it was developed by Hedi Kyle. 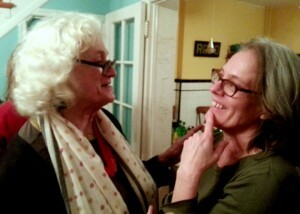 I’m convinced that Hedi and Ruth would have enjoyed one another’s company had they ever met. Both have been role models for me. I am inspired by their excitement, curiosity and passion about their worlds, their lifelong willingness to share, educate and support those of us fortunate enough to have spent time with them. The contents of the envelopes are cards, photographs or seed specimens adapted from Ruth’s archive. 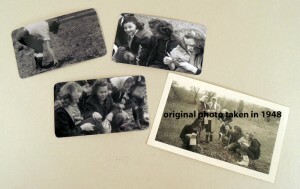 The three photographs are of teenage girls out on a seed and plant gathering adventure (taken on November 13, 1948), scanned, cropped and re-printed. 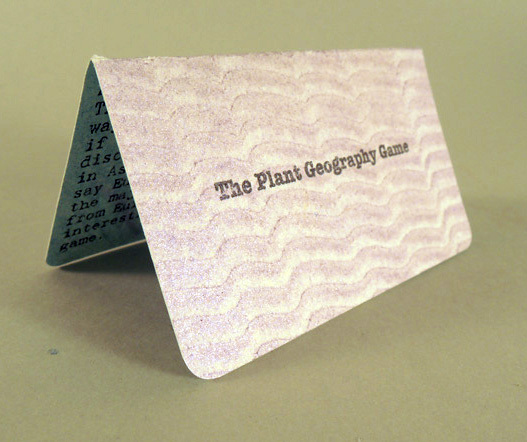 The cards duplicate Ruth’s handwriting and are taken from her many teaching files – these specific to teaching ‘her girls’ about plant identification and cultivation. 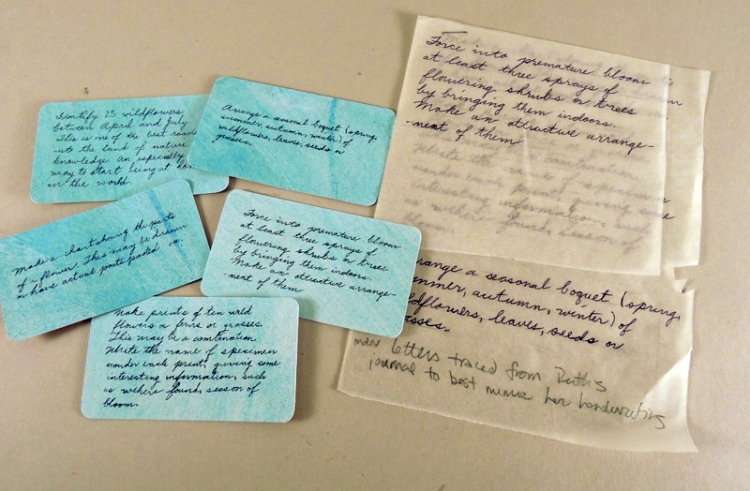 Tracing from original writings (right), finished cards (left). and an original page from Chester A. Reed’s Flower Guide published in 1916, also laminated. Page ready for laminating. Each book has a different original page from the 1916 book. These, along with a title card (colophon on reverse) make up the contents of the book. Some of the joys of designing and creating this book include time spent going through Ruth’s collections of photographs and writings, teaching my studio assistant Stefanie how to fold the pages (this is now one of her favorite activities and she has her own project in development utilizing the Blizzard Book), working with a rich, purple Nigerian goat (from Harmatan), a luscious and tactilely rewarding material, and making pastepaper for the project while listening to Western Bird Calls. I used pastepapers inspired by Lucinda Carr for the text cards. Note: several years ago, Lucinda Carr (invited me to her studio for a day of pastepaper production. Lucinda was producing and selling some fabulous paste papers and I was eager to learn her work methods. We set up and when it was time to go to work she said “This is my secret for making great paste papers – I listen to bird call identification recordings while I work”. As I’ve worked with these materials, I’ve had not unpleasant moments of wistful sadness (sentimental nostalgia?). Some of this is related to missing Ruth but there is something else this material stirs up I me. I’ve developed quite an attachment, crushes of a sort, to these girls (a few of whom are pictured again and again, on other outdoor, educational adventures, in Ruth’s photo albums), my emotional response based solely on impressions of who they may have been, these girls who so appreciated nature, whose curiosity and willingness to explore was endlessly nurtured by Ruth. I feel envious sometimes that I wasn’t one of “Ruthie’s girls” – many of them remained lifelong friends of Ruth’s and went on to nurture other young women throughout their own lives. As I ruminate on the adventures Ruth’s archives document I feel a yearning to connect to my younger, more able-bodied, less educated self. 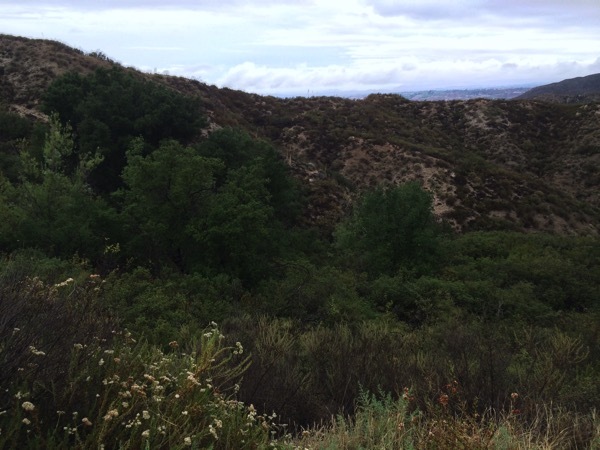 I long to experience once again lovely stretches of time when activities such as of going out, alone or with others, to identify wildflowers the only mission aside from eating a picnic lunch in a wooded grove, perhaps near a running stream. 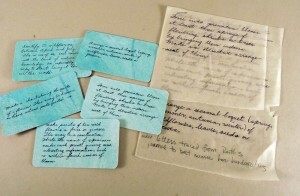 An archive of process materials is housed at University of Denver, Penrose Library, Special Collections. Wildflower Identification is out of print. 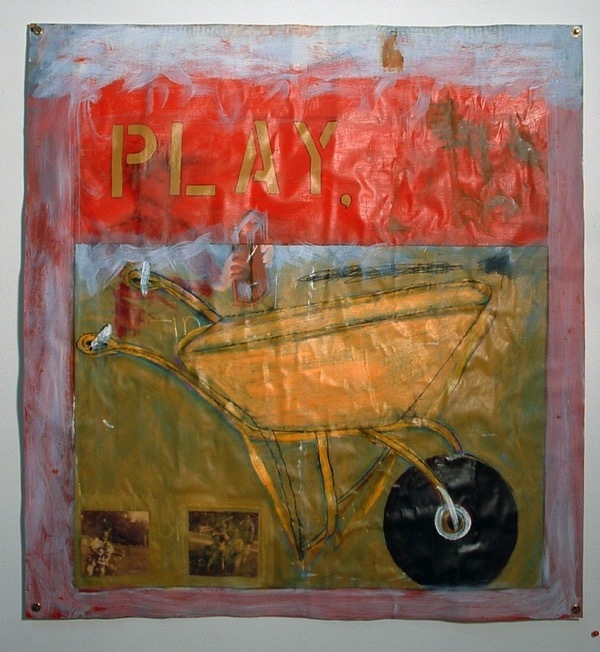 I’m once again thrilled that the pieces I’ve created using from the archives of long-time Denver resident Ruth Wheeler will be on view in public spaces . 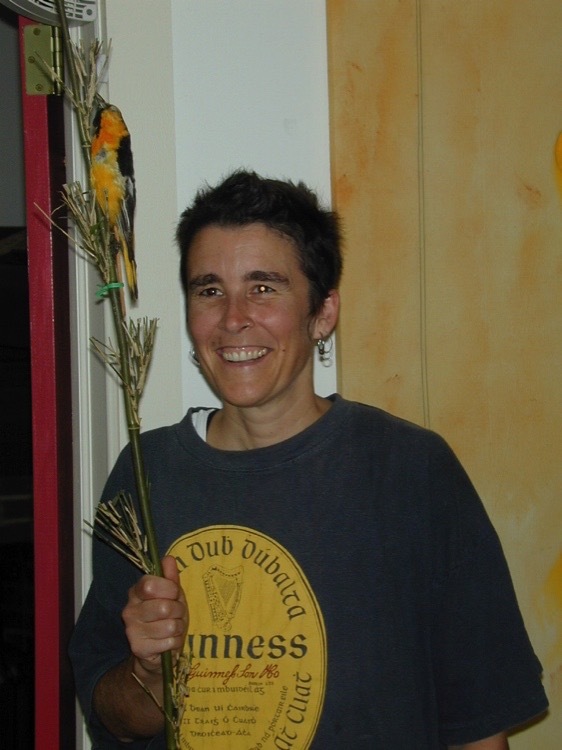 . .
Lovely and Amazing is a series I began in 2006, is a tribute to Ruth Wheeler, beloved biology teacher, naturalist, youth advocate and feminist who lived and worked in north Denver for 70 years. Filled with curiosity, Ruth found the natural world a place of endless delight. 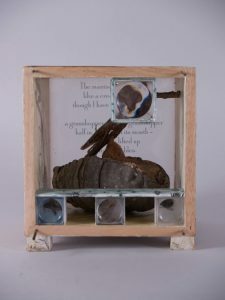 She left behind a collection of biological specimens, notes and photographs which I have incorporated into a series of three-dimensional collages, boxes and book works. Wasp and Praying Mantis pictured below. 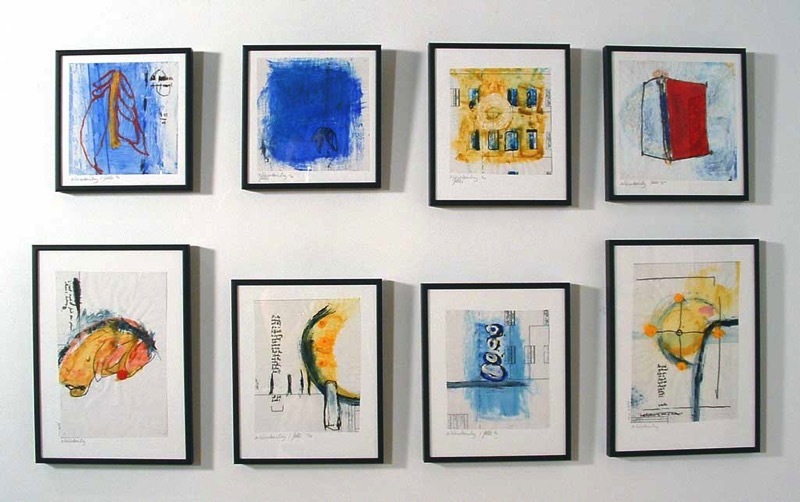 Nearly all the book works (and a few of the boxes) from the Lovely and Amazing series are on view at University of Denver’s library January 5 through March 29. The former Penrose Library, renamed Anderson Academic Commons after a complete remodel of the existing building, now houses curated exhibition areas throughout the three level structure. Thanks to the ongoing support of Special Collections librarian Kate Crow and Anderson Academic Commons exhibits curator Rebecca Macey, my work is on display on the main level, strategically located near the main entrance/coffee shop. The library’s generous open hours (24/7 during some weeks of the year) puts this at the top of the the list for Denverites and visitors looking to engage with interesting exhibits at odd hours. 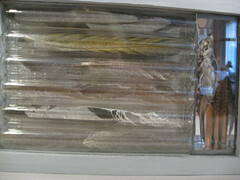 On the top level of the library is the Gottesfeld Room where the bulk of their collection of artists’ books are stored in glass fronted cabinets. 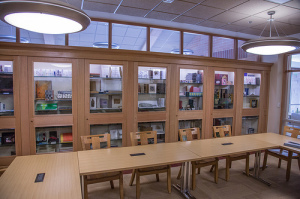 The room is open access during library hours but for hands on viewing of the books, visitors need to make an appointment with Special Collections, open from 9-5 Monday – Friday. Although I’m not a University of Denver “Pioneer” (i.e. 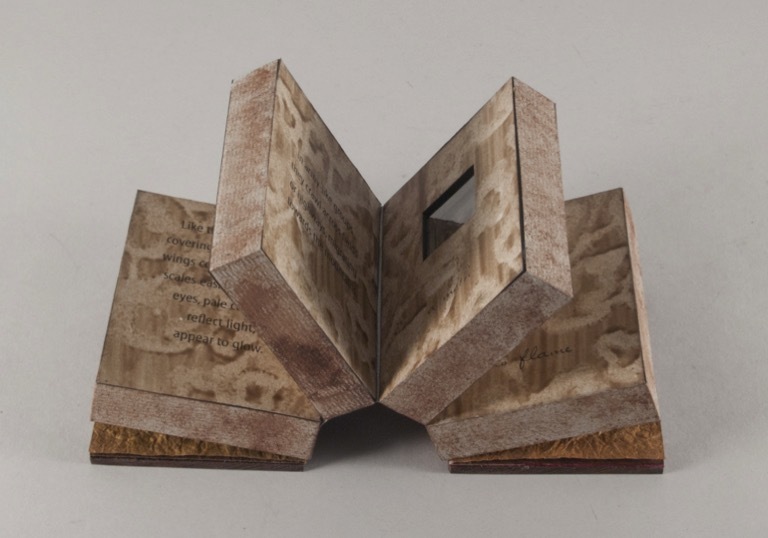 alum), I am pleased beyond measure that Penrose Library Special Collections has taken on the role of designated repository of my work in the book arts field. 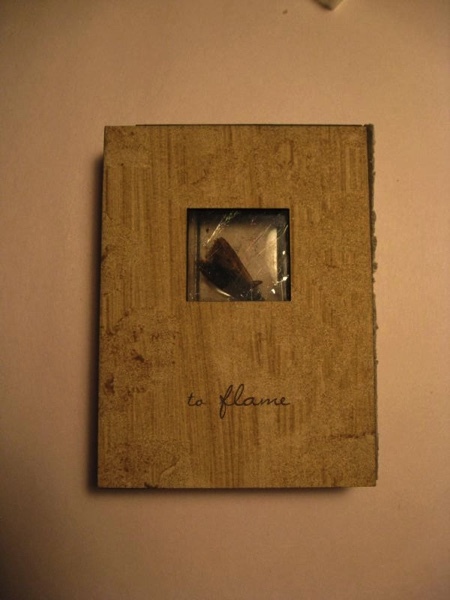 What this makes possible in terms of display are exhibits such as the 2013 exhibit in Special Collections in the lower level of the library featuring the process materials of one of my edition works, Burning Me Open, alongside process materials from a series of works by Laura Wait (whose book works are also collected by Penrose Library Special Collections, University of Denver). 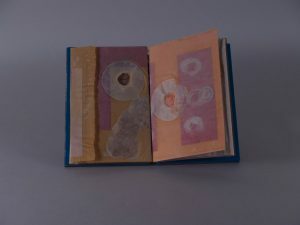 The books from this series were also been exhibited at 23 Sandy Gallery in Portland in 2013. 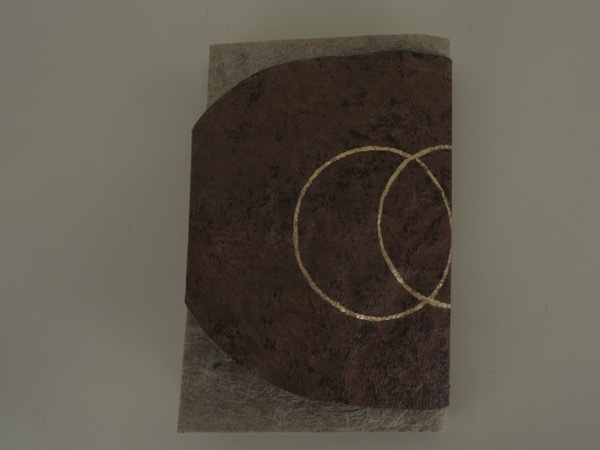 Also on view at University of Denver are books of mine created in response to works in Lovely and Amazing, such as Mica (pictured below). 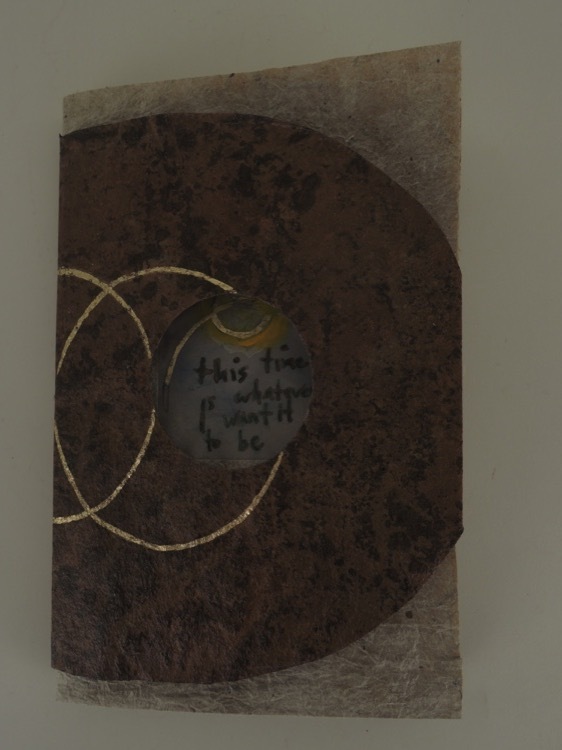 Two Plus – a series of box works I’ve been working on for several years, on view at Spark Gallery, North Annex, in Denver, Colorado January 30 – February 23 2014. I work from the premise that an object is anything we can talk or think about (including intangibles such as emotions, beliefs, fears). More than one of any object creates a minimum of one relationship or connection; the more objects, the more connections. 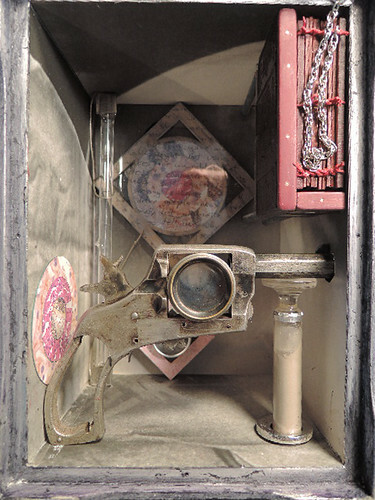 For me, examining the nature of objects involves considering how they are related to both their properties, and their connections with other objects. 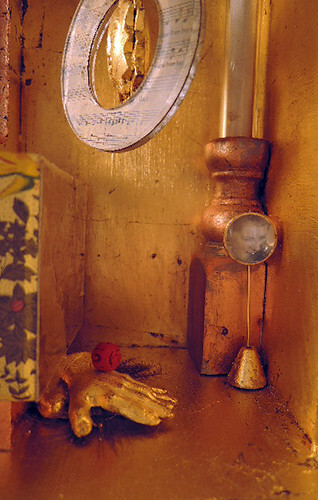 I have taken on as my task the creation of connections between objects and the subsequent examination of the relationships between objects. For the Two Plus series, I’ve been working with objects that relate specifically to a characteristic embodied by either a particular individual, or to a time/place in my history that was governed in part by a specific characteristic. Thus the objects selected have either a direct link or strong associative link to these particular characteristics. The series as a whole has developed into an examination personalities both real and imagined. This year I have been able to exhibit this multi-faceted body of work in two stellar locations. 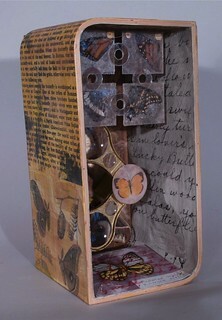 In June/July 2014 the Lovely and Amazing books were displayed at 23 Sandy Gallery in Portland, Oregon and this fall the boxes and 3-D collages in the series will be exhibited at Niza Knoll gallery in Denver. Lovely and Amazing, begun in 2006, is a tribute to Ruth Wheeler, beloved biology teacher, naturalist, youth advocate and feminist who lived and worked in north Denver for 70 years. Ruth found the natural world a place of endless delight. 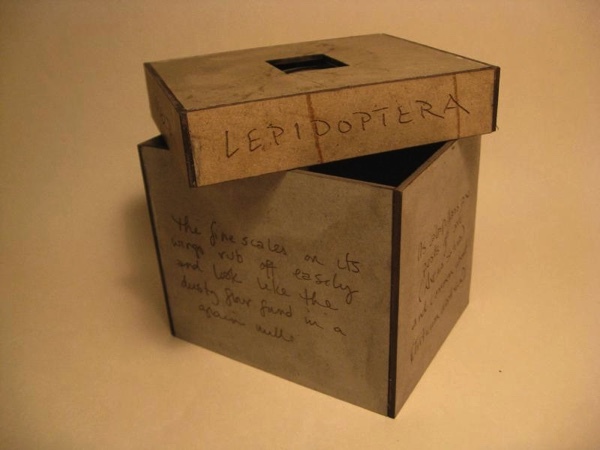 She left behind a collection of biological specimens, notes and photographs which I have incorporated into a series of three-dimensional collages, boxes and book works. Ruth was my great-aunt, and, because she raised my father, her role in our family life was much as a grandmother’s might be. She was educated, reverent, passionate and endlessly curious. Unlike anyone else I have ever known, Ruth was an important figure in my childhood. Visits to her house might include walking her ferret around the block on a leash, trying to coax the giant snapping turtles to do more than lie around in the big wash tub in the back yard or agitating the miniature alligators that lived in the basement utility sink. 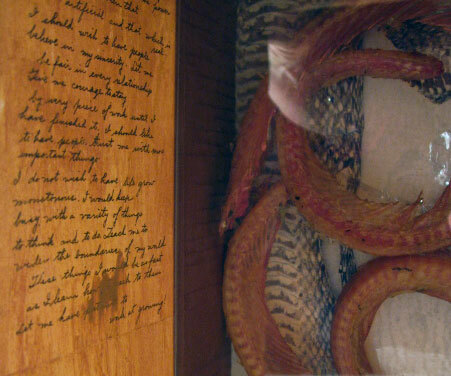 My favorite visits were those that included feeding the snakes from the stock of white mice that Ruth raised for that purpose. There was a kinkajou living in the basement. He had a peculiar odor but I nonetheless loved creeping down to the basement at night to watch his nocturnal pacing, his protruding eyes luminous in the dark. Born in 1899, Ruth lived, lucid, independent and strong, well into her 99th year. Although other family members moved in and out of that house over the years, it was always Ruth’s house in my mind. This rotating roster of inhabitants seemed always to perch around the edges of the real inhabitants of the house, Ruth’s collections of creatures. 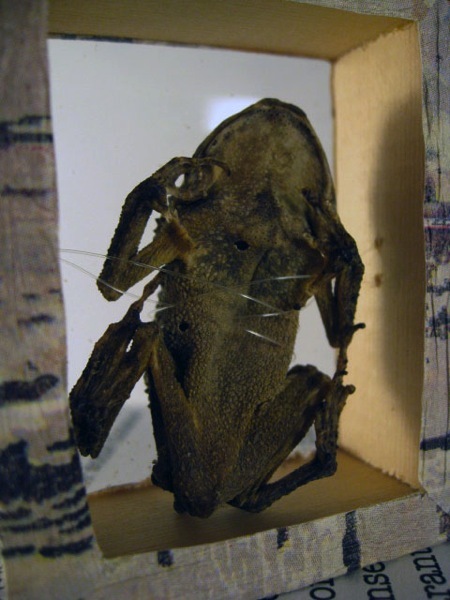 Not pets, these birds, mammals, reptiles were collected, cared for and eventually preserved. During her final decade, I stayed with her on my visits to Denver. I spent afternoons recording her as she told and re-told tales of her life. 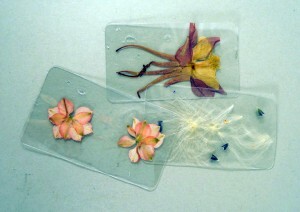 Concerned about what would happen to her collections, Ruth started gifting me with a variety of biological specimens. 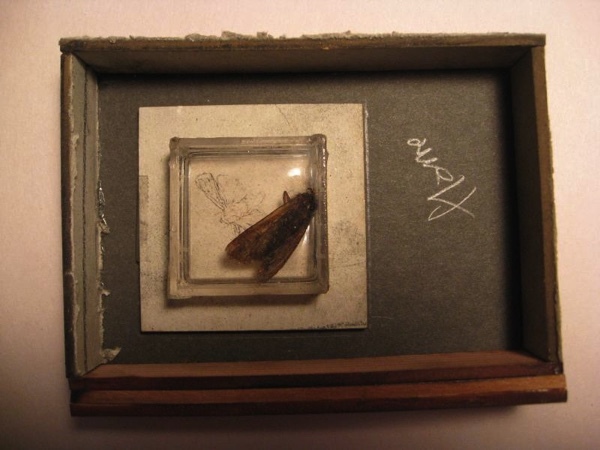 As I boxed up her various collections (things such as insect specimens, snakeskin’s in old jelly jars, stuffed birds on sticks, owl pellets, taxidermied small rodents, fossils and preserved plants) she told me stories. She told me about the ornithologist who taught her a down and dirty method of preserving birds and other small creatures and about the day she was called home from school when one of her king bull snakes escaped its cage and was coiled in the bathtub, my great-grandmother trying to retrieve it with a spatula. Later, when readying her house for sale, I retrieved and stored many of the letters, photographs, family heirlooms she, along with other family members, had left behind. Seven years passed before I began incorporating these objects into my own studio work. I relish the days I spend in the studio working on this project, thinking of Ruth with a smile. Testudines is the order of reptile more commonly known as turtles, tortoises and terrapins. In addition to it being a great word (I have a fondness for multi-syllabic words with hard consonants in the middle), it is representative of a creature I was fascinated by as a child . 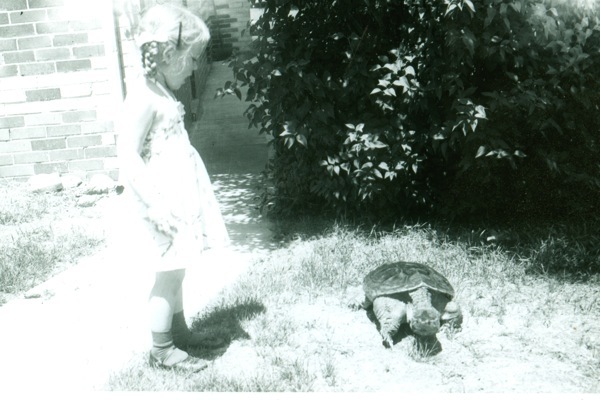 I love this picture of me watching a snapping turtle in my aunt’s back yard. Turtles appear in my dreams often; I rejoice when they do as I then wake refreshed and excited to face the day. Testudines are some of the most ancient reptiles alive. 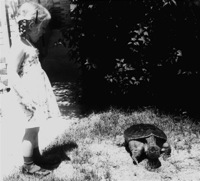 The ones my aunt kept in the back yard for a time were most likely snapping turtles, big, slow and a little big scary because of the hissing sound they made. They seemed to spend more time napping then snapping and feeding them was not nearly as exciting as feeding the snakes was. 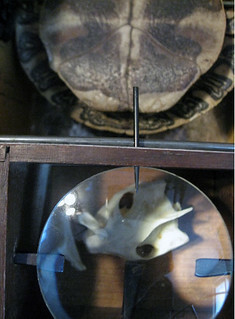 I’ve been working on an assemblage with specimens from Ruth’s archives – Testudines Box. This box assemblage is the 3rd I’ve made using hardwood boxes that measure 12x6x7, two of the four corners curved rather than square.The two previous are Lepideptura Box and Bird Box. 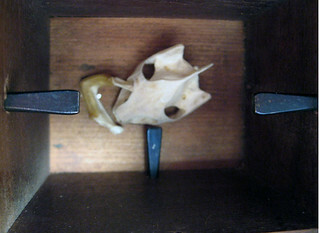 Testudines Box includes the shell of a Red Slider turtle along with the skull and jawbone of another Red Slider (this placed in a wooden box and magnified). 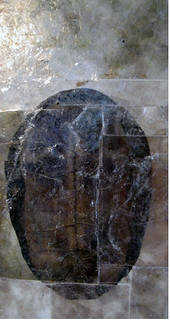 These artifacts are arranged in front of a color scan reproduction of the same turtle shell overlaid with mica. 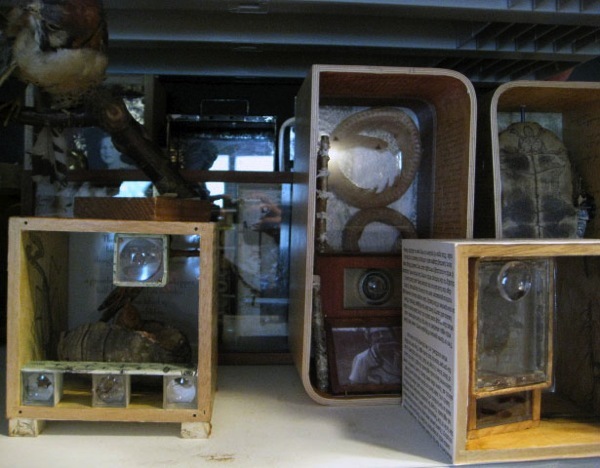 The interior box walls are lined with a repetition of an Emily Dickinson poem written out by Ruth in her journal, the exterior walls with instructions for digging out a laying of turtle eggs from one of Ruth’s many nature education books, an encyclopedia entry and images of turtle anatomy from various published nature studies. Today I learn that the song of the Creeper is weak, colorless and sibilant. That it consists of 4-8 notes, generally beginning with a long high-pitched note, followed by two short lower-pitched ones. The remaining notes vary somewhat, but are often a repitition of the first notes. A common call note is a long, high-pitched “shreeeeee” with a rolling r-sound throughout. The bird also calls a rather faint ‘tsit’ over and over. These latter notes maya be heard at any season. I also learn that the bird is easily identified by its habit have creeping continually up the rough bark of a tree in a spiral, then flying to the base of another tree to begin again. I read nesting notes written by a W. C. Bradbury in 1918 (thanks to the folks at internetarchive.org) describing a foray in Gilpin County while on a White-tailed Ptarmigan and Brown-Capped Rosy Finch nest seeking mission. Their trip had the happy result of taking the first set of eggs of the Rocky Mountain Creeper taken in Colorado. Armed with the vision of a small brown bird diving at the base of tree trunks, I begin to build an environment for the Creeper on a stick I have in my collection. I decide on a small shadow box. I can’t decide which side of my creeper I want all to see, a mirror box helps resolve that questions. I am charmed by Bradbury’s 1918 anecdote so decide to include it in the box. 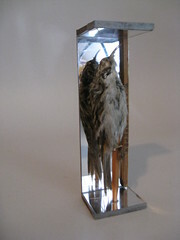 Conveying the feeling of lightness that birds so well express, is one thing I strive for. Here we go – all assembled, but hard to photograph with so many layers of reflective surfaces. I finished this book in 2011 as part of that year’s Book A Week project. 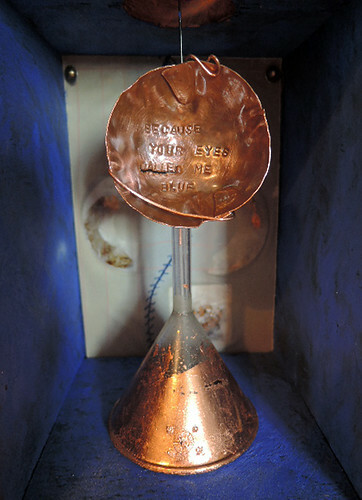 I’m posting about it now because it is currently on view in the Bound and Unbound II exhibit at the University of South Dakota. My book is in great company in this exhibit – so many much admired book artists also have work in the show. I haven’t seen the exhibition but the link to the online catalog is here, and the artist listing is here. 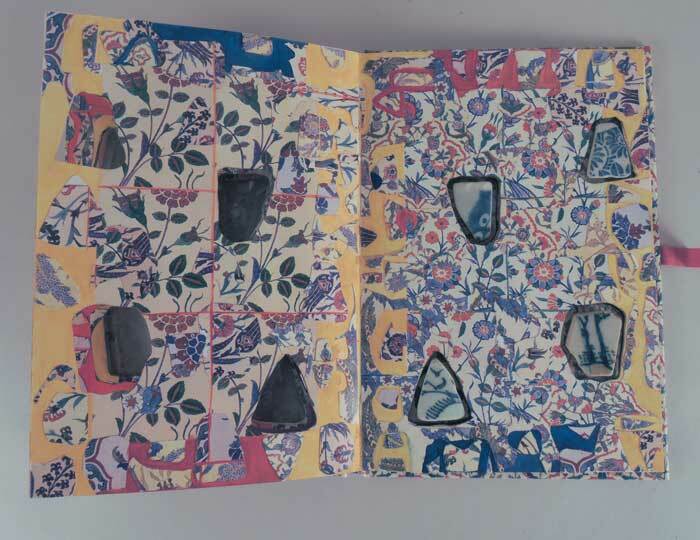 It is one of but a handful of altered books I’ve worked on, this one starting with Indian Floral Patterns, from Series I of the Victoria and Albert Colour Books. 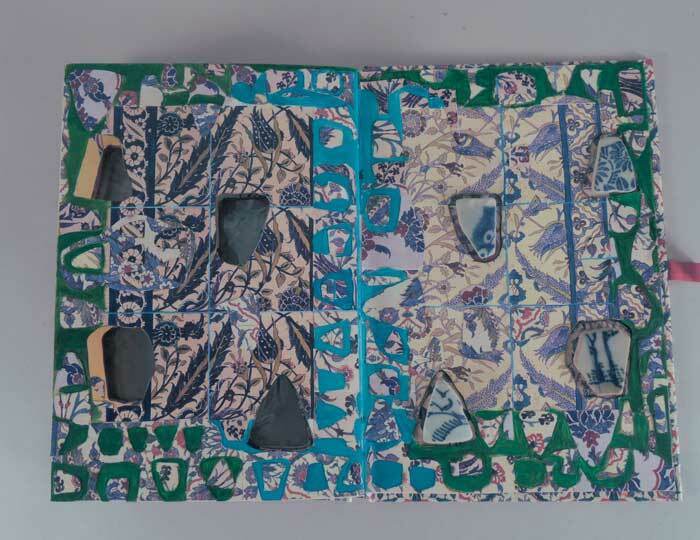 I’ve also altered a second in the V&A Series – Tile Paintings from Series II. 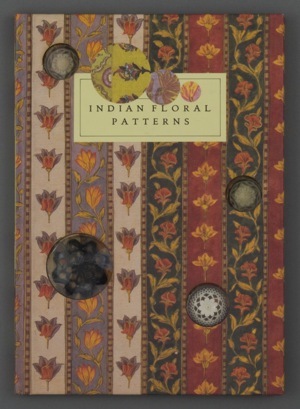 For Indian Floral Patterns I cut 3 round holes through the front cover and all of the pages. In the recesses formed by the holes rest four bone beads hand-carved in India. The beads are protected when the book is closed with mica laminated in between the first end page and first few pages of the text block. 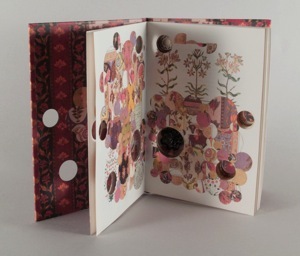 Circular paper cut outs in a range of sizes, picturing the same floral patterns depicted in the book, have been collaged onto the individual pages, obliterating the text. 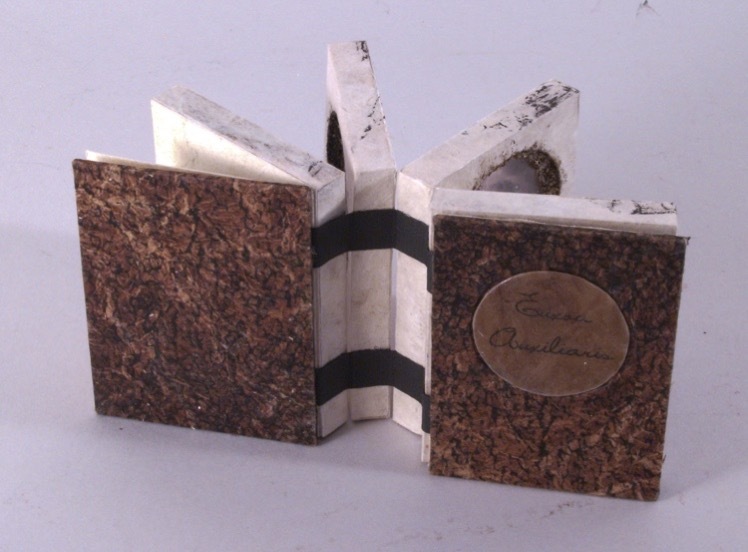 The book is housed in a custom clamshell box and is available for purchase here.